Rock engraving discovered in the Black Hills before the early 1700's, provided evidence of over 7,000 years of Native American habitation. These specific mountains are within an hour drive of the Pine Ridge Reservation and are considered sacred by the Lakota Sioux. In 1851, the first Treaty of Fort Laramie was made, clearly marking the boundaries of the sovereign nation of the Lakota Sioux land. The Homestead Act signed 10 years later by President Lincoln, unleashed a flood of white settlers upon the Lakota Sioux land and people. In 1863, an uprising of the Santee Sioux Tribe in Minnesota ended with the hanging of 38 Sioux men. Ordered by President Lincoln, this remains the largest mass execution in U.S. history. A few years later, dishonoring all previous treaties, trails and train tracks were placed through the heart of the Lakota Sioux land. 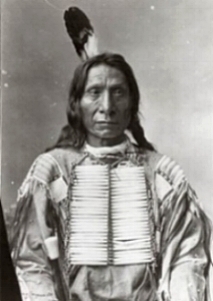 In defense of their legal rights, three tribes led by the Lakota Chief, Red Cloud began an ongoing campaign against the U.S. Army. In 1868, the second Fort Laramie Treaty was signed, guaranteeing the sovereignty of the Great Sioux Nation and the Lakota Sioux ownership of the sacred Black Hills. This is the only time in U.S. history that the government negotiated peace by conceding everything asked for. In 1874, General George Custer announced the discovery of gold in the Lakota Sioux territory, specifically the Black Hills, creating another influx of white settlers. General Custer recommended that the U.S. Congress find a way to end the treaties with the Lakota Sioux. Two years later, the Lakota War began over the violation of the Fort Laramie Treaty. This ultimately led to years of bloody battles, starvation, and blatant massacres of the Lakota’s leaders, men, women, children and animals. After ultimately being driven from their homes as prisoners of war and forced into concentration camp confinements (now known as Reservations), the U.S. Federal Government sold off the Lakota Sioux land and funded the creation of Mt. Rushmore, a 60-foot, carved message to the Lakota Sioux people, memorializing four U.S. Presidents on the face of their most sacred place. Today, the Lakota Sioux Tribe is mostly unknown or forgotten by mainstream society. Native American Indians are left to suffer in silence. Hidden away in the southwest corner of South Dakota lies the second largest Native American Reservation in the U.S., Pine Ridge Indian Reservation home of the Oglala Lakota Sioux Tribe. With no industry, technology or commercial infrastructure to provide employment for its residents, this Native American population lives in conditions equivalent to those found among the poorest, third world countries. Event after centuries of loss, injustice and insurmountable living conditions, many members of the Lakota Sioux Tribe are still fighting to preserve the health, wealth, longevity and legacy of the tribe.